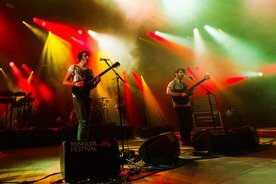 Foals have called their comeback single Exits, and that calm oddness is a perfect reflection of what you can stream below. A song that’s recognisably Foals, but one that harks back to the crazy, mathy early days rather than the outright banging later ones while retaining popular intensity, a nod to the past and a sign of an exciting and different future. There’s two albums coming from Foals, and we’re very excited. The video’s better than many films too.